Virgin Australia group executive for airlines John Thomas says changes to Sydney Airport’s hourly movement cap to help grow regional routes would allow the airline to offer more flights to smaller cities and towns in NSW. 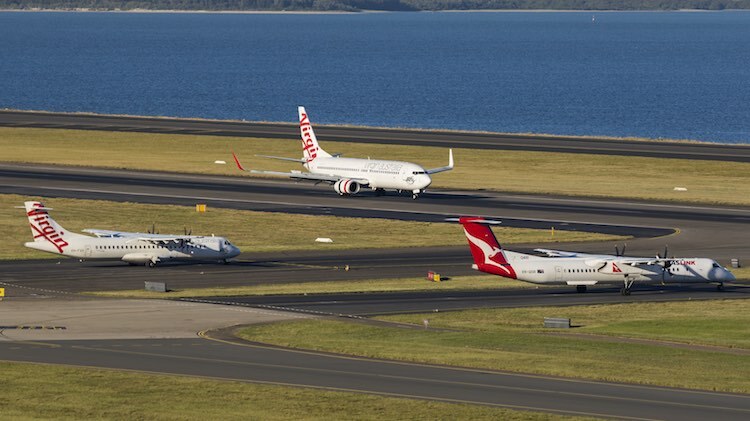 Currently, Sydney Airport is limited to 80 aircraft movements per hour between 6am and 11pm, with some peak-time slots dedicated to NSW regional flights under legislation. Thomas says Sydney Airport is more than capable of accommodating more flights per hour and reiterated Virgin Australia’s position advocating an increase in the hourly cap. “We’ve obviously publicly stated that we would like the cap to go from 80 to 90 and we’d be fine if those additional 10 slots went to turboprop only,” Thomas told Australian Aviation in an interview on the sidelines of the International Air Transport Association (IATA) annual general meeting in Cancun, Mexico on Sunday. In April, Virgin announced it was reducing its ATR 72-500/600 fleet from 14 aircraft to just six and closing its Brisbane turboprop base as part of a wider fleet simplification program to reduce costs, improve operational efficiencies and support a return to profitability. That would leave Virgin’s ATR fleet to be used on intrastate routes from Sydney, as well as on Sydney-Canberra and Melbourne-Canberra services. Thomas said a higher movement cap at Sydney could support a bigger Virgin turboprop operation out of Mascot. “We’re stuck at this 80 number at the moment,” Thomas said. Another artificial constraint on Mascot is the way the cap is calculated in 15-minute blocks, which can prove restrictive in times of bad weather or when there are disruptions to normal operations. Thomas described the 15-minute block as “crazy” and very inefficient. “I went out about six weeks ago to Adelaide and I was in the jump seat and as we were taking off the runway I heard the controller say to a Cathay 777 that had just got to the end of the taxiway ‘you’re going to have to wait for three minutes because we don’t have any more slots’,” Thomas said. Sydney Airport, tourism groups and even a NSW state government committee have backed an expansion of the hourly cap for regional routes. So what advantage is it to VA if they are only going to have 0-6 props ? Why was the Cathay 777 given startup clearance when slots had been allocated? Why would/should a government give more slots to Sydney and jeopardise the economics of an airport it is building? The effective cap is 76 but its a secret . They employ a “counter” in Sydney tower to ensure it never ever breaks 80. Absolute joke . The Labor govt brought in the system. Bloody joke. Virgin couldn’t make regional routes in Queensland work. How do they expect to make NSW and Victoria work when it is a more competitive environment? Without more information, the you will have to wait three minutes because we haven’t any more slots is meaningless. jeopardise the economics?? We already know the new airport doesn’t stack up economically! Sydney Airport would have invested in it if it did. What will more flights achieve when aircraft are holding on the tarmac for a gate to be available? I regularly experience 20-30 minute delays awaiting a gate to be available for an aircraft. Yesterday it was 40 minutes at international terminal despite a gate change! Its a farce born of politics and a company operating a monopoly!!! More slots would be available if all the freight flights were moved away. Perhaps Badgerys Creek should become a dedicated freight hub, at least for overseas flights … not for late night newspaper and parcel deliveries between the capitals. I’ve always felt Goulburn would make a good international freight hub (with an appropriate lengthening and other infrastructure upgrades) as it is right next to the main Syd-Melb road and rail corridors. No curfews there and it would bring untold economic benefits to the town. Would Bankstown be a possibility for upgrading to regional aircraft capability? AlanaH, Bankstown is capped with the length of the runway, also the boundaries of the airport. Goulburn would make sense, maybe the Wagner’s could upgrade it…. Western Sydney Airport will solve problems with all slots, landings, take off… Kingsford Smith Airport will be easy to ruling, soon after opening Western Sydney Airport. Only seven years away. A Goulburn upgrade would only be feasible if the Wagners did undertake to do it! No point waiting for the Fed or NSW gov’ts to get around to it. That will never happen! Point taken about Bankstown. Thanks Derrick.